Will need a Xbox 360 controller. 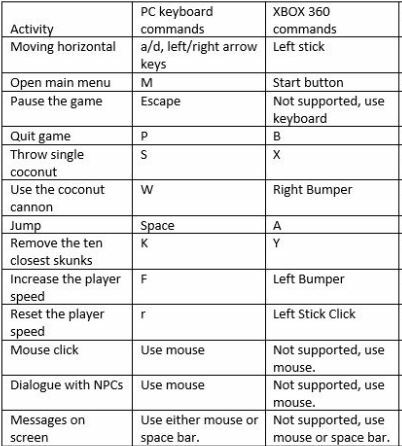 The user will still need to use the mouse and keyboard for interaction with other characters in the game, as well as, navigating the main menu. The way in which the game is designed is that Snake goes through the game from Level 1) Rendevous to 17) Harris’ with the objective of finding his family. Then after finding the family realizing that he cannot leave the island because of the “Curse of the Cart”. So to be able to leave the island and finish the game, Snake needs to solve this by going back to the beginning of the game. During the second round through the game, Snake has to go to the hidden levels to find people like Claude, the Pirate, the Hermit, and the Colonizer to get clues as to how to get the curse lifted. There are huge treasure boxes that belong to the Colonizer that is left randomly throughout the game along with keys. These boxes are not accessible until the player has a key and have be given the quest by the Colonizer. The amounts of gold received is on the large side to help when the player falls into the sea water or have been attacked by a swarm of unhappy butterflies. When the player dies after seeing the Colonizer you loose access to the hidden levels and have to go back through level 17 and refinish your mission to then go on to find up to all 7 boxes (or 70,000 or more coins on hand) and then return to the Colonizer to finish the end of the game. For greater and more effective story telling, we have added a new dialogue system. The Player can be to frozen in place when the dialogue is long otherwise it is purely informational. A new menu system added to the game shown in the following images. 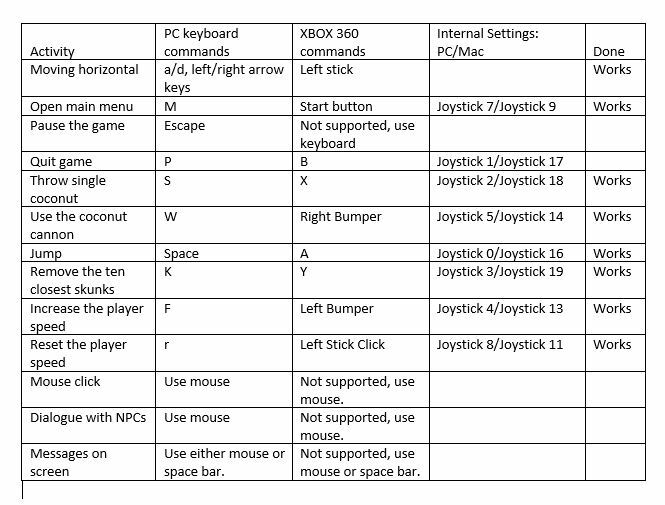 This was added for Xbox 360 controller. 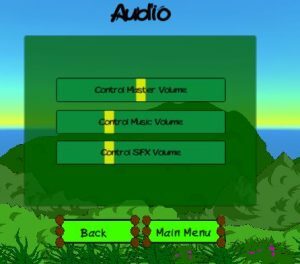 The user will still need to use the mouse and keyboard for interaction with other characters in the game, as well as, navigating the main menu. This is accessible from the Start Game first and will show up in the Level Select menu after. The basic mechanics is covered here with the pickup of coconuts and lives. The player gets to practice a double jump to pick the coconuts on the first coconut tree. Also the player can try jumping into the sea water. 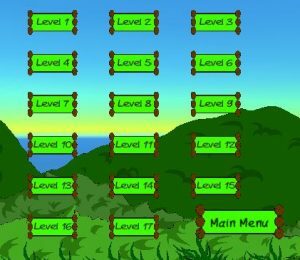 Here the player has to pickup and pick the coconuts to be able to exit this level. The prefix links these levels to a visible level of the same number. Example, 1. Pirate’s Lair is accessible from a whiskey barrel on the first level. Some of these levels are accessible either by a barrel or a monument. 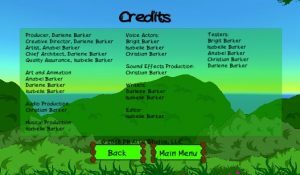 These finds the player in the scene and bite. They only appear after the family is found and the player has learned their way through the visible levels. These can be eliminated with a coconut but they can hurt the player. These are here for shear decoration. These birds can hurt the player if the player runs into them. These can be eliminated with a coconut but they can hurt the player. These can hurt the player if the player runs into them. These can be eliminated with a coconut but they can hurt the player. These hurt the player if the player runs into them. These can be eliminated with a coconut but they can hurt the player. Cannot hurt the player except takes the brunt of all the players inventory. So after exiting the Mill, the player can exit the game or restart the game going in the direction that the player wants to versus the linear path. You are able to double jump throughout the entire game. For a stronger jump, speed up the player (F), hold the jump button down a little bit, and then a second time. 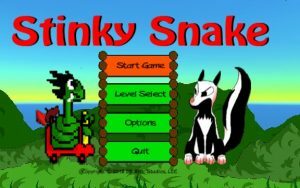 There is a single boss throughout the game – Skunk who is Snake’s antagonist. With the default difficulty level being set to normal, the Player can choose to set this to either Easy or Hard. For a less difficult experience, set this to easy under the Main Menu > Options > Controls. The boss interactions are based on difficulty levels as well. The more difficult, the more health the Boss will have, the more stomping and coconuts that will be needed to eliminate the boss. No punching from the Skunks. When you fall into the water or loose life, you do not loose anything in your inventory but a life item. Running into the saws cause 25% damage to the Player. The Skunk Eliminator causes a loss of 20% damage. The Player loose half of coin count when their life is lost in the game. Running into the saws cause 50% damage to the Player. The Skunk Eliminator causes a loss of 40% damage. The Player looses all of their coin when they loose their life in the game. Running into the saws cause 100% damage to the Player, the equivalent of loss of life. The Skunk Eliminator causes a loss of 80% damage. The Player can bump into a skunk which will hurt both. The Player can jump onto the head of a skunk thereby eliminate the skunk. This does not work the boss, only on other skunks. The Player can throw coconuts at skunks which is the most effective method for hurting enemies. 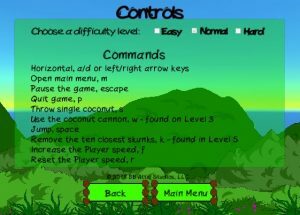 Throw a single coconut with the S key while three coconuts with the W key using the coconut cannon which can be found on Level 3. The Player can push skunks off a platform while being careful not to get punched by the skunk being moved. The Player can ignore the skunks completely but this approach would not add to score. This approach also does not hurt the skunks. The Player can use the Skunk Eliminator to remove the closest ten skunks at a time. Depending on the difficulty level there is a penalty for using this weapon. The penalty is Player health therefore limiting the use of this weapon which can be found on Level 5. This is the Health Reload that refills the Health heart under the Level number. On some levels, a large pineapple does the same thing as well. These are lives that you are collecting. Take these to get to the next level in the game. Shown here is the clover that the Player will need to collect from the Witch on Level 7 after the second visit. The Leprechaun requires the clover for communication with the Player. Beginning in Level 9, the leprechaun appears and requires that the Player has the clover in inventory.